What a week its been. It felt so good to spend the weekend putzing around in the kitchen after returning to Philly from a busy week in San Juan. Partly for work, and partly for play, I was undoubtedly mesmerized by the vibrant color, climate and culture. After going from 83° to 23° in a matter of hours, I was happy to spend a couple of days cooped up, with no real agenda to attend to. After an unfortunate break in at our house the night I got back into town, we were both in a bit of a haze the days following. It's truly unsettling to suddenly not feel comfortable in your own home, and after copious amounts of wine that first night following, the ultimate cure seemed to be what it is for pretty much everything, chocolate. A favorite dessert of mine, tweaked this time around with lavender and sea salt, it's so easy to make and tastes incredibly decadent. We go through a lot of avocado in this house, and as much as I love the flavor, that's not what sticks out here. While you don't taste the avocado, it's the perfect base that makes the pudding so creamy. 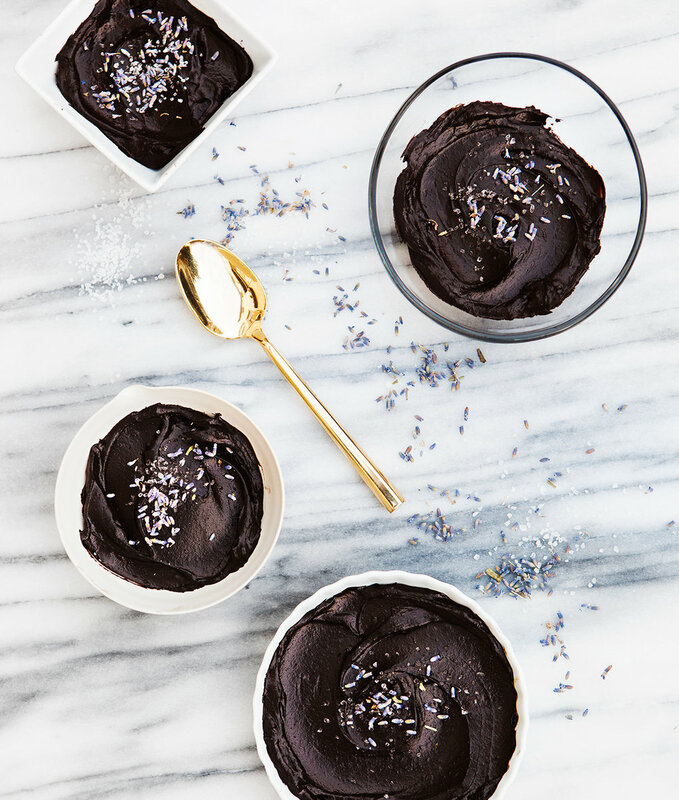 Using dark cocoa powder gives it an extra level of richness, and infusing the almond milk with lavender is a simple addition that adds a hint of floral flavor. Served with a pinch of sea salt, it's easy enough for a weeknight chocolate craving, and is the failsafe cure for all woes, big or small. In a small saucepan over medium-high heat, combine almond milk with 1 teaspoon dried lavender. Let the mixture come to a rolling boil. Remove from heat, and set aside to steep for 5 minutes. Strain the lavender from the milk and set aside. In a food processor or blender, combine avocado, cocoa powder, lavender infused almond milk, coconut sugar and vanilla. Blend the mixture until completely smooth, about 3-5 minutes. Scoop the pudding into small serving dishes and chill, covered for 30-45 minutes. Serve with a sprinkle of dried lavender, and a pinch of sea salt.